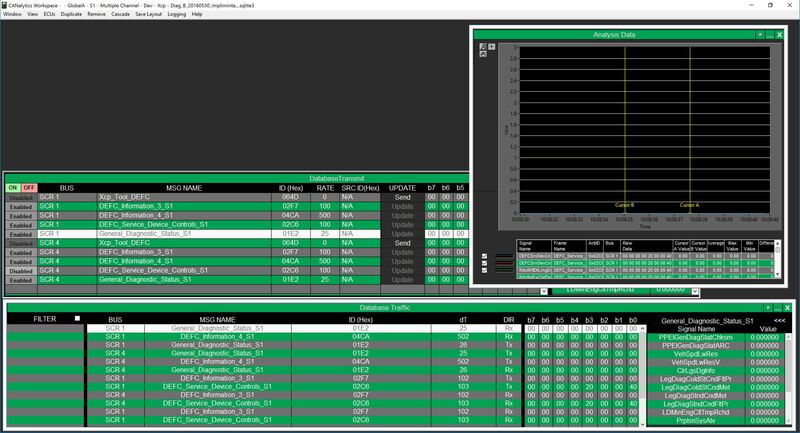 CANalytics CAN interface software provides an interface to maximize the benefits of CAN bus hardware, particularly for automotive and aerospace applications where it provides a durable network that supports communication between multiple electronic control units (ECUs). On CAN networks, devices are equipped with controller chips to allow them to see, filter, and prioritize messages. Traditional CAN analysis tools created to provide an interface and automate devices on the network are extremely extensive and subsequently expensive. Because much functionality often goes unused and the tool is needed during only a portion of development, the cost of an advanced platform is difficult to justify. The CANalytics platform makes all the benefits of CAN accessible in one cohesive application with a CAN interface as a standalone executable. R&D or ATE engineers can develop custom applications through a fully featured interface, and use that interface to integrate automated processes. The CANalytics platform includes a CAN database and editor. Several resources to help you become more familiar with CANalytics software, including a webinar with product demo and product comparison sheet. As a leader in automotive test, Wineman Technology combines dedicated engineers, the latest technology, and state-of-the art equipment to solve critical testing challenges across a spectrum of applications for motorized vehicles and equipment. Try now! 30-day trial download available on National Instruments' website.